We offer a full range of personalized interior decor products manufactured in our workroom. We provide expert guidance with selection of color and texture of fabric, and design styles. 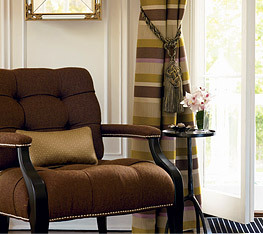 We offer custom upholstered furniture, re-upholstery and window coverings. treatments from Lafayette, Hunter Douglas, Castec, Norman, Signature Series, and many more.